Warm air gathers near the ceiling, the highly efficient mini split ceiling mount draws in the warm air that accumulates, cools the air, and then disperses it throughout the room. Designed for cooling wine cellars up to 500 cubic feet. The evaporator is installed right in the cellar, and the condenser is installed up to 100 line ft. away. WSS CEILMINI, this in-ceiling mounted Mini Split System Cooling Unit is a great option for maximizing the racking space within your wine cellar. This wine cellar cooling unit is the perfect way to create a wine cellar with absolutely clean walls! This cooling unit will not impede on your wine racking design, and will be virtually unnoticeable in your wine cellar! The Mini Split Wine Cellar Cooling System is the wine cellar ninja of cooling units. The unit has a smooth black grille, making it perfect for colour matching. This way the Mini Split Wine Cellar Cooling Unit will blend seamlessly in with the rest of your cellar setup making it the 'unnoticeable' within your cellar! The WhisperKOOL Split Wine Cellar Cooling System requires professional installation by a licensed refrigeration technician. WhisperKOOL's Split Systems combine industry leading components with a elegantly simple engineering to offer quiet and efficient operation for an optimal wine storage environment. The Platinum Split sets the standard for in cellar split system installations. 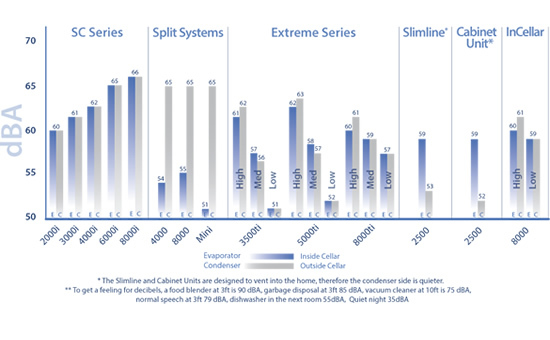 The platinum line allows for improved airflow efficiency (25%) and operates 10% quieter than the previous split systems. At the same time it is 35% smaller than the previous split system (4000 & 7000). The split system still uses Vinotheque's liquid bottle probe for monitoring the actual liquid temperature. The fully Ducted system allows for virtually silent cellar as unit is mounted up to 25 duct feet from the cellar. KDT controller allows for wall mount or flush mount installs. Designed with Wine Storage in mind: The WhisperKOOL split systems are designed to maintain the optimal temperature and humidity levels. Allowing for these optimal conditions is conducive to the proper aging of fine wines. Humidity control: The Split System cooling units are designed to maintain relative humidity at 50-70%. The proper Humidity level is managed through the design and engineering of the unit. There are no separate switches for controlling humidity. Quiet State of Art Operation: Years of experience with our self contained cooling units has resulted in a revolutionary design that accounts for a number of environmental conditions unique to wine cellars. WhisperKOOL's Split Systems combine industry leading components with a elegantly simple engineering to offer quiet and efficient operation for an optimal wine storage environment. Flexible Indoor/Outdoor Condenser Installations: These Split Systems offer the ability to install the condenser up to 100 feet away from the wine cellar, in either indoor or outdoor conditions. The split system's flexibility when it comes to installation is a home builders and architects dream. The WhisperKOOL PLATINUM split system is designed with a 70-degree temperature differential. That means the unit can operate effectively even if the ambient temperature outside (or where ever the condenser unit is mounted) is a scorching 125 degree heat. The Split Cooling System includes both the evaporator and condenser units. If you will be putting the condenser outside, you will need the optional exterior housing. Worried about your cooling unit functioning properly in the cold? The Cold Weather Starter Kit will melt all of your worries away, and keep your wine at the ideal temperature. The Cold Weather Starter Kit is designed as an electronic bypass system made to ensure that your cooling unit's pressure stays at optimal levels. When it gets cold outside the pressure within your cooling system drops. This causes a problem for cooling systems that have a pump down cycle and a low pressure switch that turns the compressor on and off. If the temperature falls below 20°F the pressure will be too minimal to turn on the compressor causing a major problem. Fortunately, the Cold Weather Starter Kit can save the day, by bypassing the low pressure switch on start-up and keeping the pressure high enough so that your unit can even function at -15°F! Extends Condensing Unit's cold weather tolerance from 20°F/-6.5°C to -15°F/-27°C. If the condenser will be placed outside, you will also need the exterior enclosure. For the Split System series, a 24V option is also available which allows you to tie into your home electronic thermostat or home automation system, please inquire. Home Automation System tie in - If using own thermostat with the optional 24Volt conversion kit to connect to wifi then you will not be able to us the whisperkool bottle probe option. The 24V option allows you to connect to own selected thermostat technology to monitor & control your cellar environment remotely via a smart device. Please inquire on pricing. All WhisperKOOL Split Wine Cellar cooling systems are available for shipping within the USA and Canada. 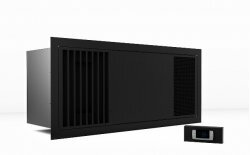 WhisperKOOL wine cellar cooling units are American made units produced in Stockton, CA, California, United States, 95205, USA. If you would like wine racking as well, we will be happy to customize a design and obtain a shipping quote for your entire order. CLICK HERE to go to our wine racks pages. California State Proposition 65 - units contain trace amounts of titanium dioxide, which is known to the state of California to cause cancer. Please make sure you complete the warranty check list to ensure your warranty is active.